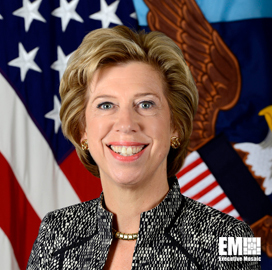 Ellen Lord, undersecretary of defense for acquisition and sustainment and 2019 Wash100 Award winner, told attendees at a recent Atlantic Council event that the Department of Defense will conduct a series of experiments on 5G communications technology, Defense One reported Monday. The DoD’s research and engineering arm will oversee the experiments scheduled for later this year. Discoveries may help the Pentagon’s advisory boards develop policy recommendations in line with 5G implementation. According to Lord, the department’s 5G research and development activities will focus on latency, interference and related equipment. “5G is a national security issue for us, especially because we have to rethink our industry base as we move forward,” she noted. Previously, Lord and other defense officials expressed concerns over Chinese telecommunications companies such as Huawei using their products to obtain U.S. data.